Daikin is the largest supplier of fluororepellents in the world. UNIDYNE has been the industry leader in delivering high performance fluorobarrier coatings that impart oil, water, and soil repellency for more than 40 years. While our foundation is global; our relationships are local. Our experienced sales and technical service staff members throughout the United States are available for help in providing solutions for your surface repellency design challenges. UNIDYNE is engineered to meet the specific needs of each application method within the carpet manufacturing process. Products are created to maximize soil and stain protection while enhancing processing and performance at the mill. Carpet products are also designed for compatibility with stain blockers and other co-additives for increased efficiency in your application. UNIDYNE textile treatments provide durable, stain protection finishes while maintaining the original soft hand of the fabric. UNIDYNE products are widely known for their superior stability and compatibility with many other bath auxiliaries. An additional benefit of UNIDYNE is that the fabric maintains its original breathable finish. UNIDYNE can provide soil/stain release, water and oil repellency, dual action which combines release and repellency, and wickable soil/stain release. It can be easily applied to apparel, technical textiles, and upholstery. UNIDYNE can be applied to nonwoven fabrics either topically or as a melt additive. It provides barrier performance for surgical apparel and work wear. It can also provide a variety of finishing solutions and performance for virtually all nonwoven substrates. It is used in medical drapes, gowns, packs, face masks, and sterilization wipes. UNIDYNE is also used in a variety of industrial applications such as filtration, insulation, linings, and felted fabrics. UNIDYNE paper treatment products routinely exceed the difficult performance requirements for oil, grease, glue, alcohol, and water repellency within a broad array of paper and board applications. Products are designed for cost-effective internal or surface applications and are compatible with other common additives, allowing for highly efficient application. UNIDYNE treated paper is also easily recycled. UNIDYNE is used in virtually all paper and board applications and is unsurpassed in quality and performance. The UNIDYNE group continues to explore and develop polymers for new application areas. Utilizing global synthesis and applications facilities, UNIDYNE literally works around the clock to synthesize new chemistries to meet emerging needs in surface modification. Some areas of current development are plastics master batching, release liners, and the ability to restore soiled surfaces. OPTOOL coating is an innovative premium coating developed by Daikin’s cutting edge fluorine technology for specifically engineered-to-protect display, optical, and glass surfaces. OPTOOL coating is designed to provide the highest surface protection with an extremely thin coating. Application: Eyeglass, Touchpanel display, Cover glass, Optical glass etc. Function: Easy clean and reduce fingerprint marking, provide low friction. Application: Plastic hard coat additives for; plastic cover lens, Optical lens, film etc. Processing Method: Adding to UV cured coating. ZEFFLE is a fluoropolymer resin used to formulate coatings with exceptional weatherability, resistance to corrosion and dirt pick-up, self cleaning properties and high adhesion to a wide range of substrates. ZEFFLE next generation fluorourethane is made with tetrafluoroethylene monomer, giving the polymer outstanding chemical, thermal, and weathering resistance. Utilization of ZEFFLE leads to the formulation of coatings with exceptional properties, making ZEFFLE one of the best polymer selections for service life and best weathering coatings available today. ZEFFLE solventborne and waterborne fluorourethanes are used in a wide range of architectural and industrial paint and coating applications including coil coatings, anti-corrosion coatings, buildings, bridges, storage tanks, and virtually any structure or surface. 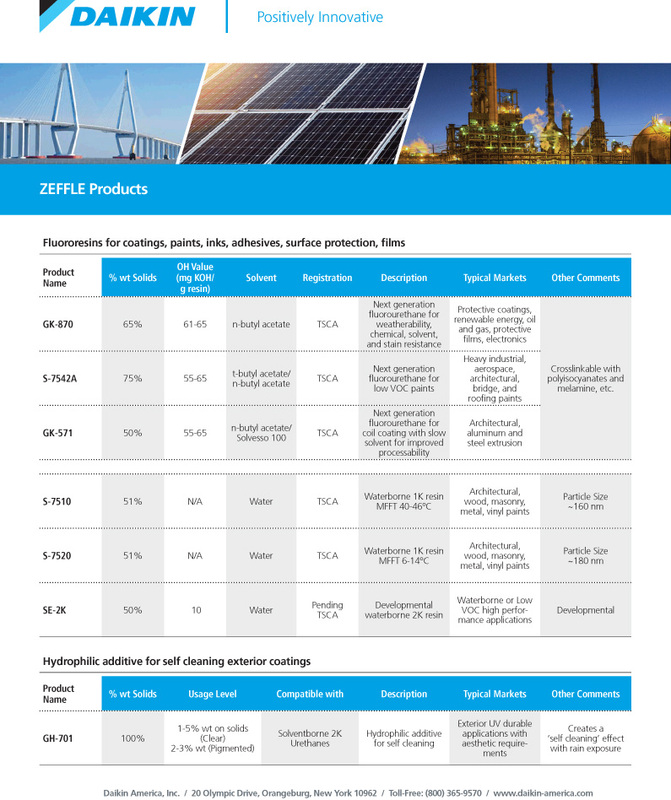 ZEFFLE is also widely used in the production of photovoltaic (PV) panels, where coatings formulated with ZEFFLE are used to protect polyester backsheets. ZEFFLE can be formulated to achieve the severe weathering and damp heat test requirements necessary to meet IEC standards for PV panels. ZEFFLE coatings are formulated for OEM (coil coating, spray booth) or for field applied coatings. ZEFFLE coatings can be applied as a clear coat or they can be formulated in bright, vibrant colors. ZEFFLE GH-701 is an additive to solvent-based coatings including our ZEFFLE GK product line. ZEFFLE GH-701 creates a hydrophilic surface on coatings which allows dirt and stains to be easily washed off by rainwater. It is suitable for sites where the aesthetics is important and/or repainting is difficult.